The 2018 Jeep Grand Cherokee Trackhawk. Floor mats trapping car pedals are like that nightmare you’ve had every so often since age 3, or whenever you actually began to form real memories (personally, I can’t recall big life events before sixth grade). Anyway, it’s back: Fiat Chrysler is recalling certain 2018 Jeep Grand Cherokees for the ol’ sticky accelerator. That’s a problem if you’re into those big, tough, American performance SUVs, because the 2018 Grand Cherokee models potentially affected by the problem are the two at the top of that model’s respective lineup: the 475-horsepower Grand Cherokee SRT that starts at $67,695, and the 707-HP Grand Cherokee Trackhawk that’ll get at least $86,200 out of you. The floor mats in the SUVs could “inadvertently trap the accelerator pedal,” FCA said in a statement this week, which probably sounds familiar to you. It’s reminiscent of the widely followed Toyota floor-mat issues that began in 2009. Those issues snowballed into more than just problems with the mats, turning into a whole huge investigation into unintended acceleration that was often found to be pedal misapplication but still cost Toyota billions of dollars anyway. The good thing in this recall, at least, is that FCA said its cars have technology to keep the gas pedal from taking over completely in the case of an issue with the defective floor mats. The company also said it’s unaware of any injuries or crashes related to the problem so far. Further, all FCA US vehicles are equipped with brake-throttle override, a safety feature that cancels a sustained accelerator-pedal input when it detects simultaneous brake-pedal and accelerator-pedal application. 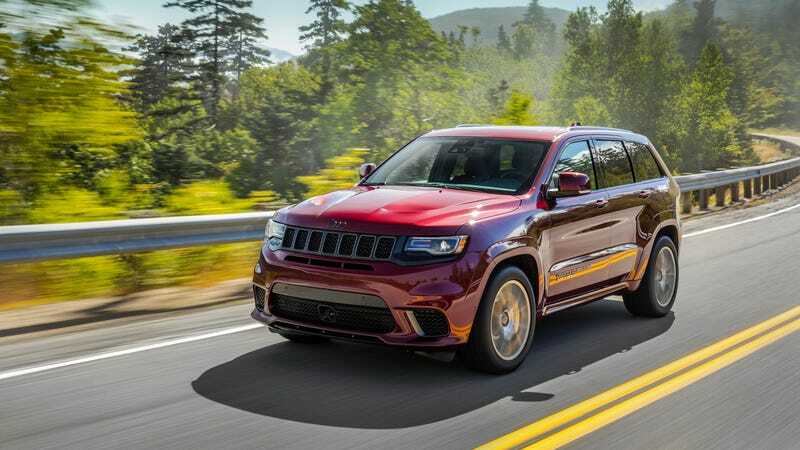 FCA said only certain SRT and Trackhawk models are in the recall, which is for an estimated 4,822 vehicles in the U.S.—a third of which are still on dealer lots, according to the company. That’s in addition to an estimated 996 affected SUVs in Canada, 164 in Mexico and 763 in other areas of the world, FCA said. The recall also includes 11 sets of floor mats sold as accessories from November 2017 to March of this year, FCA said, and the FCA website has search tools at the bottom of this page for people to see if their cars or mats are in the recall. Until any recalls can be done, though, FCA advises owners affected by the recall to take their driver-side floor mat out of the car. And, as always, do your recalls. They’re important.